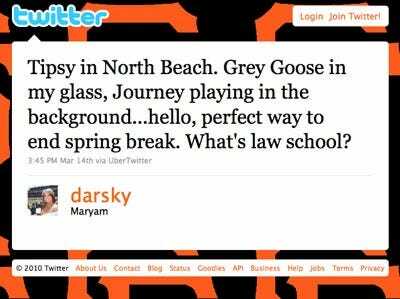 Law Student Spring Break Tweets: Is Anyone Having Any Fun? Law students across the country have spent the last two weeks avoiding the hallowed, dusty halls of the law library, thanks to spring break. At least we assumed so. Several had a great time, but some spent their week off hitting the books. 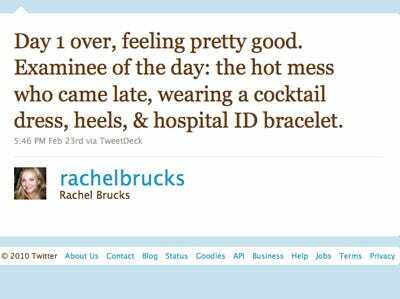 While we could pontificate on how the job market’s keeping them down and how it’s hard to budget an exotic trip when you’re living on law school loans, it’s more fun to see what real students are saying, in 140 characters or less. It was someone from Scrubs. Sigh. Well when you put it that way, it doesn't sound fun at all. Insomnia does not check the school calendar. This is what Spring Break normally sounds like.